Do you enjoy nature and being outdoors? Do you want to share knowledge with others and promote conservation and stewardship? This is your opportunity to join our team of dedicated volunteers who rove the trails, interact with visitors, host at the visitor center and in general contribute to the inspiration, education and enjoyment of park visitors. 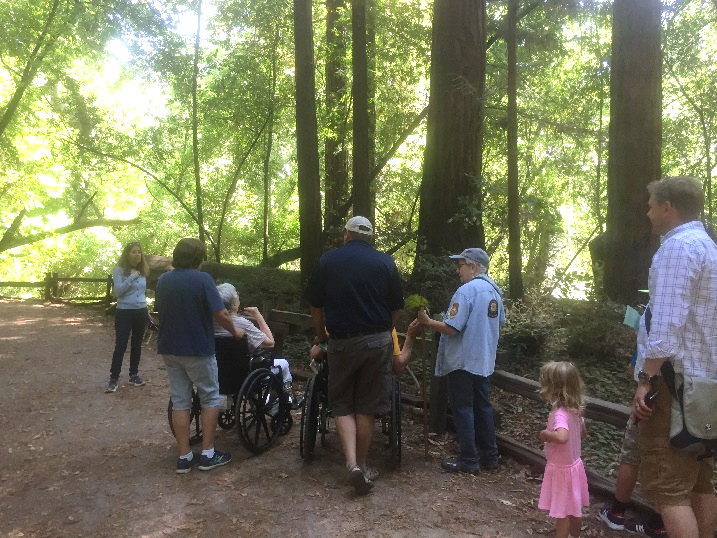 Docents: Learn about the magnificent old-growth redwoods and Henry Cowell's wonderful cultural history, then share your knowledge with the public. Call (831) 335-7077 or email State Park Interpreter l Steven.Ellmore@parks.ca.gov for more information or a volunteer application. Volunteer Trainings are every year in early spring. For information about volunteering at other state parks in the Santa Cruz district, call the district office at (831) 335-6391 or email volunteer.inparksprogram@parks.ca.gov. Buy a California State Park Pass - If you’ll be visiting Henry Cowell Redwoods State Park or other California State Parks frequently, buy a state parks pass—an excellent way to save money and support state parks. Click here for more information. Support nonprofit groups working with California State Parks such as Mountain Parks Foundation and Friends of Santa Cruz State Parks.